The Foo Fighters have a classic distortion sound, which came out of the 90’s, and seem to actually reverse into the late 70’s, with a classic hard rock crunch. The sound does not solely rely on frontman Dave Grohl’s gear, as the other guitarist Chris Shiflett has a much heftier pedalboard. In fact, Dave Grohl’s pedalboard is fairly slim in compared to Chris, though both are eclipsed by their contemporaries in terms of the sheer number of pedals. Let’s have a look at Dave Grohl’s Pedalboard. Dave relies much on his phase pedal, something we see from many guitarist who were once in the grunge scene in the 90’s (see: Mike McCready). 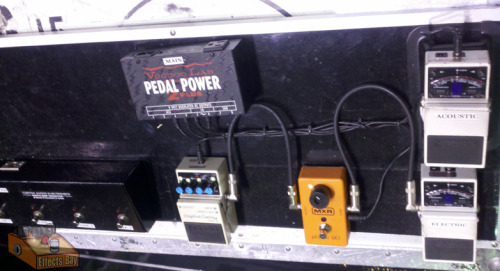 Dave has been sporting a very similar pedalboard for much of his frontman career, though the effects did get updated, as he moved on from the discontinued DM-2 pictured here to the DD-3 Digital Delay.